Carved into the foothills that straddle the border between Georgia and Azerbaijan, the cave monastery of Davit Gareja is one of Tbilisi’s most intriguing (and most popular) day trips. 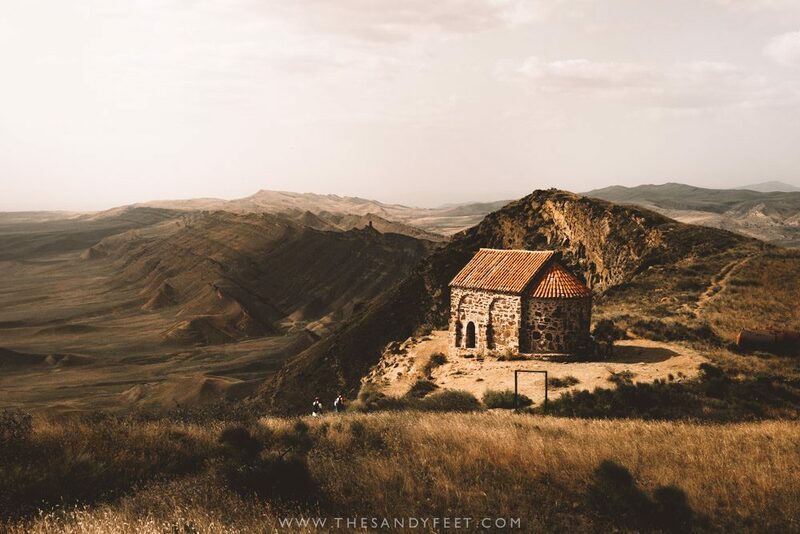 Crumbling watchtowers stand guard atop their rocky perches, intricate century-old frescoes adorn the vast tumbledown network of caves and, in the still inhabited parts of the complex, robe-clad monks wander in silence. Though this harsh and unforgiving Mars-like setting is perhaps the last place you’d expect to find such a holy site, it is perhaps what makes this place so unique, and for those without the time to make it to Georgia’s other famous cave monastery complex, the sprawling Vardzia, this is the next best thing. 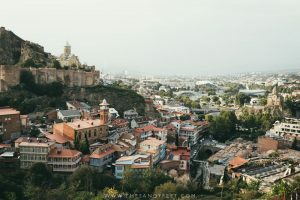 This short guide for Davit Gareja covers how to get there on a day trip from Tbilisi, what to expect and my top tips for your visit. 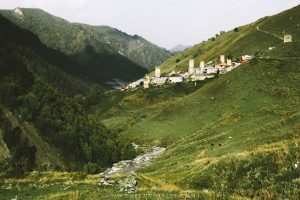 There are a number of ways to get to Davit Gareja, though by far the easiest for a day trip from Tbilisi is with the Gareji Line bus which was the option I took. There are daily departures between April and October from the far corner of Pushkin Park opposite Rosie Cafe and you’ll need to arrive by 10:45 a.m. to buy your ticket ready for an 11 a.m. departure. The nearest metro stop is Liberty Station where you can go through the underpass to reach the park. Depending on the season, several minibuses will rock up to cater for the number of visitors so you are always guaranteed a seat. It’s a long drive – around 3 hours each way – with a short break for lunch, a few photo stops and dinner. 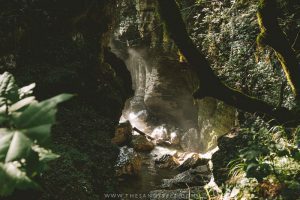 Three hours are allowed to explore the complex independently which is just enough to visit Lavra Monastery and the Udabno Caves, complete the recommended hike and enjoy the spectacular views from the top (more on this below). If you’d like to stay overnight in the area, Gareji Line also offers an open return ticket so it’s also possible to spend an extra day or two in the area to explore where you’ll definitely have the whole place to yourself. Just be sure to organise your return journey in advance so they can leave space for you on the bus. It’s also worth noting that while some sources seem to tout this as a ‘tour’, it’s really just a convenient transport option. Drivers often speak little to no English and, while you’ll be given a basic flyer illustrating the plan for the day, no actual commentary is given once you arrive. TOP TIP | Instead of relying on the lunch break, I’d suggest bringing a packed lunch and snacks with you instead and just top up with cold treats or drinks if you need to at the cafe. It’s just a little too rushed for a whole sit and wolf your food down affair. On the other hand, dinner at the Oasis Club is great and well priced, but as a number of buses tend to arrive at the same time, it can get awfully crowded with long waits for food. Be sure to rush to the bar as soon as you arrive to be one of the first in line. Arrive Pushkin Park: 10:45 a.m – Depart Tbilisi: 11 a.m. – Short Lunch Break: 12:30 p.m. – Arrive at Davit Gareja: 1:45 – 2 p.m. Depart Davit Gareja: 4:30 – 5 p.m. – Dinner At Udabno: 5 p.m. – Depart Udabno: 6 p.m. – Arrive Tbilisi: 7:30 – 8 p.m. 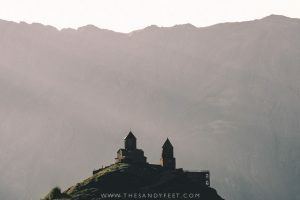 If you’re renting a car in Georgia it’s certainly possible to drive to Davit Gareja; an especially good idea when combined with the many other fabulous sights on offer in the Kakheti region instead of having to backtrack to Tbilisi. As convenient as the Gareji Line bus is, one rather frustrating thing is that it leaves so late meaning you arrive during the hottest time of the day! By driving independently, you can get an early start and arrive well before the crowds that take the bus, as well as allow plenty more time to explore the area. Search the best deals on car rentals here. Unfortunately, there is next to no information provided about the monastery complex, its tangled history and the intricate frescoes that adorn its walls. If you’re a lover of history and want a more in-depth experience at Davit Gareja, a tour might be a good option for you. Many tours start early and combine visits to enchanting Signagi in the wine country as part of a long day trip from Tbilisi. Check prices and available tour options here. Lavra Monastery Complex | This still inhabited area of the complex is closest to the parking area and will likely be your first point of entry to the cave city. During my visit, a lot of this area was under reconstruction so was only partially accessible, but you should be able to visit a few of the open cave chambers, the church and the courtyard, as well as see the monks going about their day-to-day activities. The Frescoes Of Udabno Monastery | The Udabno caves lie on the other side of the hill and can be reached along the steep trail that climbs behind the Lavra complex. 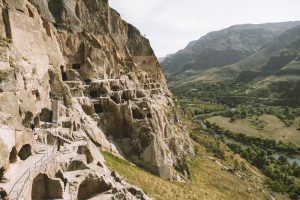 It is here where you’ll find dozens of caves peering out from the mountain, many of which contain the remnants of detailed frescoes from when the monastery was at its peak. Unfortunately, many are in fairly bad shape these days, but be sure to take a look inside a number of the caves in any case – some are definitely more impressive than others. Chapel Of Resurrection | The turning point for the hike that will lead you back to the parking area. If you’ve still got a bit of time to spare, continue on a little further to the next little chapel for sweeping views to the east that many people miss. 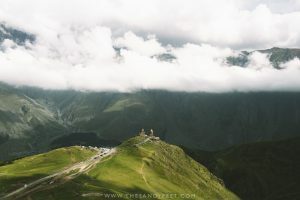 The Hike And Views | To see all these sights, you’ll need to follow the 3km loop track which begins at the parking area to the right of Lavra Monastery and climbs steeply upwards past the small watchtower to the ridgeline. Once on the top, follow the trail a short way to the right for a superb outlook across the desert. 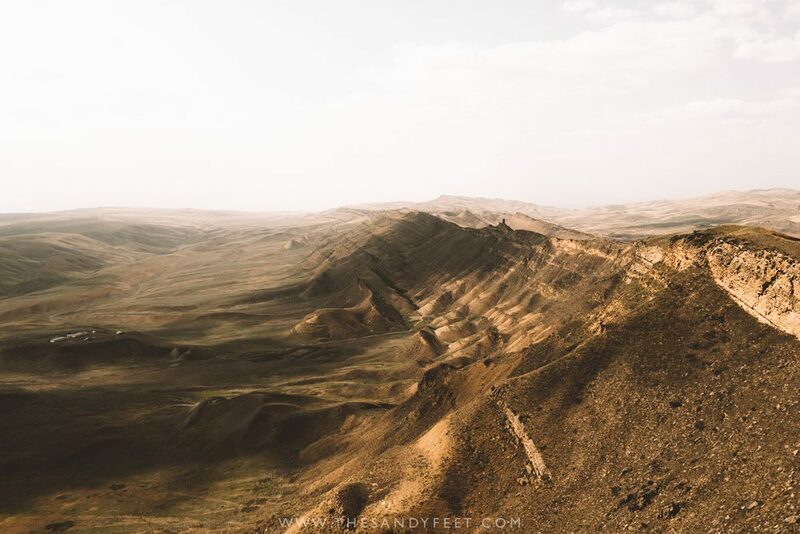 The crumpled folds of the rocky mountains, the stark crest of the watchtowers and the barren abyss of the Azerbaijan steppe. Though the cave complex was interesting enough, I actually found the extraordinarily bizarre lunar landscapes on offer here to be far more captivating. This is also the best place to take a few snaps so don’t rush because you won’t be coming back this way. From the ridge, follow the path to the left past the Udabno caves and be sure to go inside a few to catch a glimpse of the frescoes. 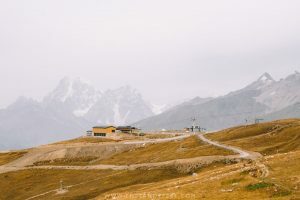 When you reach the Chapel of Resurrection, either continue along to the tiny chapel further along or return down the steep dusty trail back to the car park. Just before you arrive you’ll find a small trail on the left which leads to David’s Tears spring, a small cave and series of water channels carved into the rock. The full hike took almost the entire 3 hours given with plenty of photo stops along the way, so don’t hang around too much once you arrive. 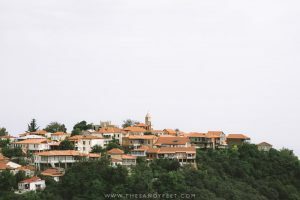 While Davit Gareja makes an excellent day trip from Tbilisi, it’s also possible to stay overnight in the area. Oasis Club Cabins | This traveller favourite is one such option in Udabno which offers rustic but charming cabins set a short way from their in-house restaurant. Check rates and availability here. Or check out one of the other lovely family-run guesthouses in Udabno here. Otherwise, if you’re visiting as a day trip from Tbilisi, you’ll be spoiled for choice. Fabrika | I stayed at much-loved Fabrika for my 2-week stint in the city and returned every time I was passing through. This sprawling hostel is an excellent choice with plenty of common areas to kick back, a host of restaurants, cafes and bars, easy access to the metro, spacious, comfortable rooms and all the creature comforts that make a good hostel great. Or browse through the many hotels and guesthouses available in Tbilisi here. 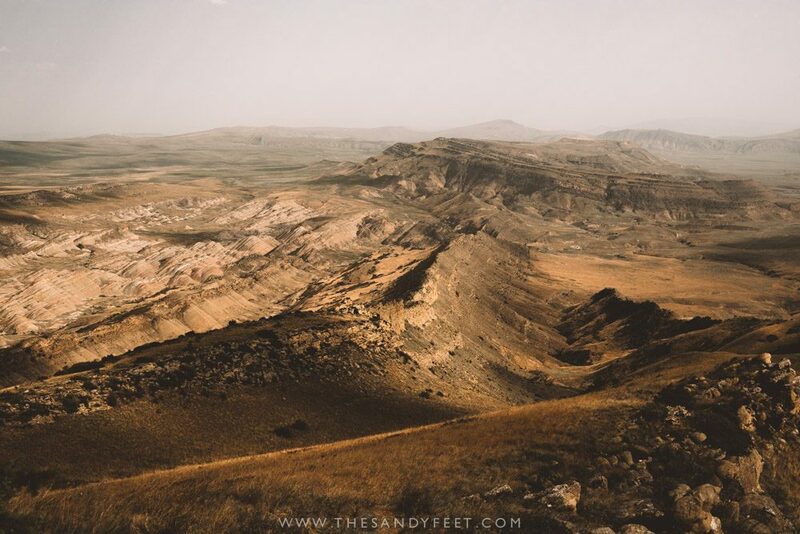 Bring proper sun protection and plenty of water | The heat in this barren and dusty region of Georgia is no joke – it’s bloody hot out here! Even in mid-September, temperatures were sweltering and the sun was blazing across the desert. Once you’ve left Lavra Monastery, there’s little to no shade on the rest of the walk so proper sun protection and adequate water are crucial. Definitely apply suncream before setting off, a long-sleeved shirt and hat are also a good idea, and refill your bottle before setting off to explore the complex. From memory, there’s a tap near the parking area. Bring snacks or a packed lunch | In terms of food, there’s nothing available at Davit Gareja, and while you’ll generally stop somewhere for a short lunch break, it can still feel like an awfully long time until dinner. Best is to bring your own food instead and just pick up a cold drink or ice cream on the way. 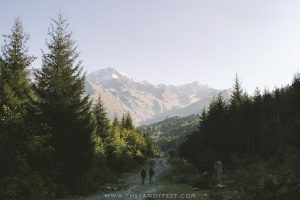 Hiking boots – not essential but a good idea | The hike is fairly easy – there’s no big boulders to clamber across or loose scree – but there are some quite steep sandy sections which can be slippery if your shoes don’t have any grip. I saw quite a few visitors shuffling along at a painfully slow pace to avoid falling on their butts. We’ve all been there! Hiking shoes aren’t really essential but solid closed shoes are definitely a good idea. Dress Modestly | While modest clothing is not strictly enforced, there are monks pottering about and it’s simply a basic sign of respect to cover up, or at least bring something with you to wear inside the monastery complex that you can easily remove once you begin the hike. Shoulders, cleavage and thighs should all be covered. It’s a border zone | Strung along the border between Georgia and Azerbaijan, heavily armed border patrols along the ridge are a prominent sight. While the guards are generally fairly relaxed and may greet you with a curt nod, they may not be quite as forgiving if you decide to traipse too far across the border. Watch out for snakes | The blistering heat and dusty trails make a perfect habitat for these slithering creatures. Though I didn’t see any during my visit, if you’re here during the hotter months and one of the first to arrive keep your eyes peeled. Some species are venomous. Sit On The Left | To the left, to the left. Yep… if you can, a left seat on the bus is the best way to go. You’ll get the best views on the way there and the sunset on the way back. Heading to Georgia? Start planning your trip with these guides!